Giovanni ‘Gio’ Ponti, one of the most influential architects and designers of the 20th century, was born on this day in 1891 in Milan. During a career that spanned six decades, Ponti completed more than 100 architectural projects in Italy and abroad and also designed hundreds of pieces of furniture, decorative objects and household items. As an architect, he made a significant impact on the appearance of his home city. 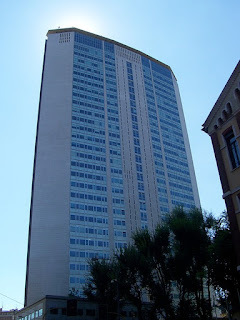 The Pirelli Tower, which for 35 years was Italy’s tallest skyscraper, is the building for which Ponti is most famous, but it is only one of 46 in Milan. He also designed the Montecatini buildings, the Torre Littoria (now known as the Torre Branca) in Parco Sempione, the San Luca Evangelista church in Via Andrea Maria Ampère, and Monument to the Fallen in Piazza Sant’Ambrogio. Ponti’s work was by no means confined to Milan, however. Elsewhere in Italy, he designed the Mathematics Institute at the University of Rome, the Carmelo Monastery in Sanremo, the Villa Donegani in Bordighera, the Gran Madre di Dio Concattedrale in Taranto and the Hotel Parco dei Principi in Sorrento. Outside Italy, he worked on projects in 12 countries. Notable Ponti buildings around the world include the Denver Art Museum in the United States, the Ministries Building in Islamabad, Pakistan, and the the Villa Planchart in Caracas, Venezuela. Ponti also worked for 120 different companies as a designer, creating designs for furniture and household objects that included the Superleggera chair for the furniture maker Cassina, which combined strength with ‘super light weight’. Made from ash wood, it weighed only 1.7kg (3.75lb). After a classical schooling in Milan, Ponti enrolled in at the Faculty of Architecture at the Politecnico di Milano but his studies were interrupted by the First World War, in which he served with some distinction. Reaching the rank of captain, he received the Bronze Medal and the Italian Military Cross. He also painted watercolours of his companions in arms, and while based in the Veneto was able to observe the architecture of Palladio. Once he finally did graduate, he married his girlfriend, Giulia Vimercati, with whom he had four children - Lisa, Giovanna, Giulio and Letizia. 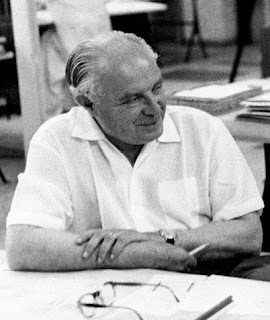 Ponti began his architectural career in partnership with Mino Fiocchi and Emilio Lancia, at which time he was influenced by the Milanese neoclassical Novecento Italiano movement. The first building he designed in his own right was the house in Via Giovanni Randaccio in the Sempione district of central Milan, where he also lived. He co-founded in 1928 the magazine Domus, of which as editor he would oversee some 560 issues, in all of which he wrote at least one article. As an academic, he delivered lectures in 24 countries. The 1930s were years of intense activity for Ponti. 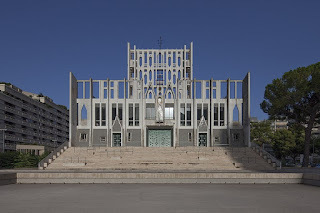 During this time, he shifted towards Modernism with the Borletti funeral chapel and houses in Via de Togni, via Letizia and via del Caravaggio that were designed for the Milanese bourgeoisie, the Torre Littoria and the Rasini Building. He designed the San Michele hotel on Capri and a building for the Faculty of Arts at the University of Pavia. In the 1950s he was involved in projects as diverse as urban planning in Milan, as the city began a period of intense redevelopment of areas bombed during the Second World War, and designing the interiors of ocean liners. 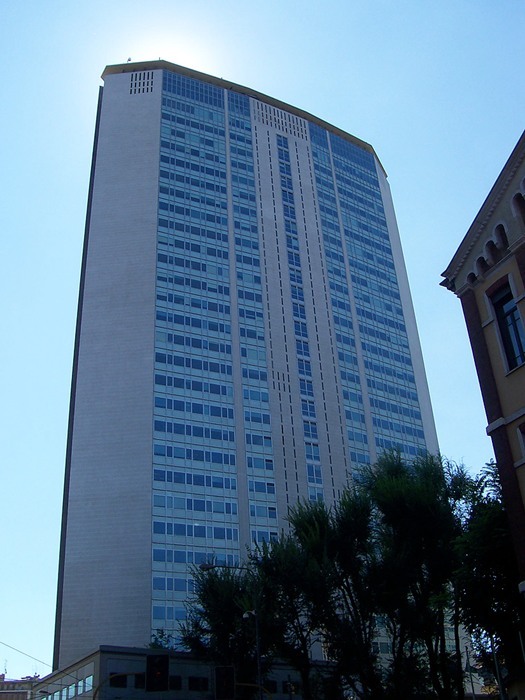 After a period working in Brazil and Venezuela, he began his acknowledged masterpiece, the Pirelli Tower in Milan, in 1956, working with another great Italian architect, Pier Luigi Nervi. Rising to a height of 127m (417ft), it was among the first skyscrapers to abandon the customary block form, Ponti designing a futuristic slender shape with tapered sides drawing to a point at each end, which viewed from above would resemble the outline of a ship. It was hailed as a symbol of corporate success and an optimistic catalyst for economic prosperity. 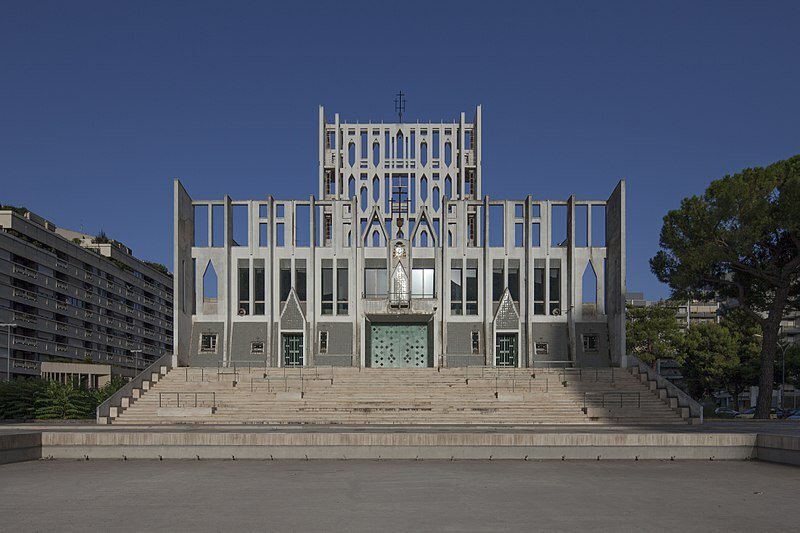 In the 1960s he built the Milan churches of San Francesco and of San Carlo Borromeo, before turning his attention away from Latin America to the East he built his ministerial buildings in lslamabad and a villa for the businessman Daniel Koo in Hong Kong. Even as he approached the age of 80, Ponti was still making his mark. 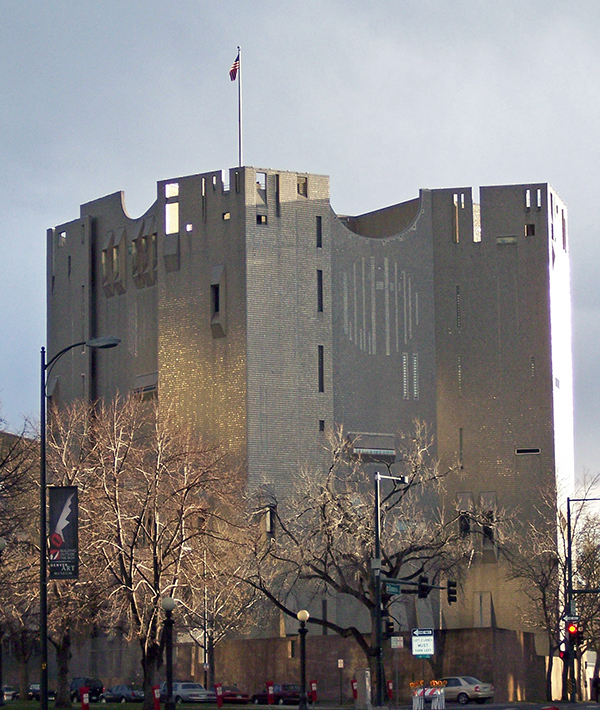 He designed his Cathedral in Taranto when he was 79 and had turned 80 when he produced his iconic design for the seven-storey castle-like North Building of the the Denver Art Museum in Colorado. Ponti died in 1979 at the age of 87 in his eighth-floor apartment in the Via Giuseppe Dezza, where he and his family had lived since 1957 and which reflected all of the ideas with regard to layout, walls, furniture and objects that he had developed during the 1950s. The city of Taranto, where Ponti’s modern cathedral is considered one of his major works, sits on the inside of the heel of southern Italy. 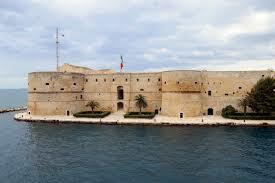 A major naval base, it has a spectacular setting between a sweeping bay and the Mare Piccolo, an inland sea. One of the biggest cities in pre-Roman Europe, contemporary Taranto is a city of two distinct parts – a somewhat crumbling centro storico on a small island protecting the lagoon, and new city of wide avenues laid out in a formal grid. In the 1930s Mussolini had a quarter of the ancient centre demolished to build apartment blocks, and it was badly bombed in the Second World War. The old city - the Città Vecchia - contains a castle built by Ferdinand of Aragon in 1492, behind which are the ruins of an ancient sixth century BC Doric temple. The city’s original cathedral, which dates from 1070, has been remodelled with a Baroque façade. 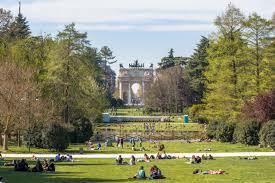 Parco Sempione is a large park in Milan, with an overall area of 38.6 hectares (95 acres), located in the historic centre of the city. The adjacent to the gardens of the Sforza Castle and to the Arch of Peace, two of the main landmarks of Milan. A third prominent monument of Parco Sempione is the Palazzo dell'Arte, built in 1933 and designed by Giovanni Muzio. Also in the park are the Arena Civica, the public aquarium, and the Torre Branca tower, which used to be known as the Torre Littoria, a 108.6m (356ft) metal structure with a viewing platform at the top.